Mind-Body guru Eric Franklin takes his teachings of body design and imagery and focuses on where posture begins—the feet. Happy Feet: Dynamic Base, Effortless Posture emphasizes imagery to work directly with the nervous system and change the way one uses their body. 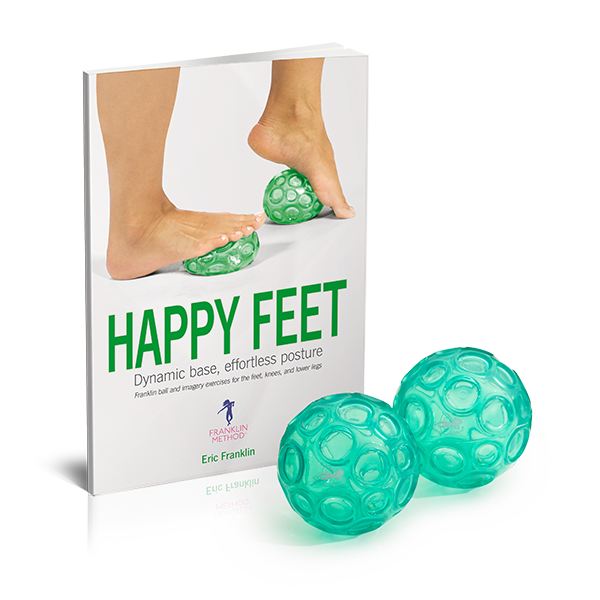 The emerald green Franklin Textured Balls feature a unique texture that stimulates the muscles’ relaxation reflexes; they’re an integral part of Happy Feet and other Franklin Method® exercises. Beyond the feet, they are the perfect density and size for relaxation of the neck, jaw, elbow, hip and more. Each ball measures approximately 4" in diameter. Franklin Balls come inflated but needle inflating pump is required to adjust firmness (sold separately). *People with known sensitivities may want to consider using the (orange) Smooth Franklin Ball Set when performing the Franklin Method exercises. Set includes Happy Feet: Dynamic Base, Effortless Posture and two Franklin Textured Balls. This is a must have set. The exercises in the book maximize the benefits of the balls. I keep the book and balls with me in my room, and take them with me when traveling. My intention is to use them every day. My back pain has been minimized along with tension. I hope that one day I can take an actual class with Eric but for now this is the next best thing. This is a great book. The feet are so often sadly neglected or exercised with boring repetitive movements. In this book you will find numerous enjoyable ways to work with your feet, as well as really useful information about how our feet evolved to work and what they need to remain healthy. We teach Franklin Method Ball exercises in Pilates classes and in private sessions. Generally, if clients use the balls once, they purchase a set for home and travel. For our older clients, this is one of the best tools for balance using the Franklin Method foot exercises. The balls are durable, maintain the air pressure once filled, and can be washed in warm soapy water for common use. These balls are wonderful for the feet and balance work. I use them every day for my own feet, including standing on them and practicing various exercises. Clients are always surprised by the difference they feel after using a ball to work with one foot and compare it to the other one. One feels like a block of wood, compared to the newly released and dynamically adaptive one they rolled. Almost everyone buys a set to take home with them. If you have problems with your feet, these can definitely help. Funny to think that my mom was the hardest sell on this of all my clients. She&apos;s been experiencing foot pain for 3 yrs, which has begun to seriously affect her walk (therefore other parts of her body) and limiting her activities too. She was convinced only specialized massage could bring her any kind of relief. After trying to "persuade" her of the many benefits of these Franklin balls, I simply gifted her a pair, along with some simple instructions, and guess what: I&apos;m right at last! RELIEF! For the first time in 3 yrs she woke up with no pain in her feet, AT ALL. She&apos;d tried tennis balls and foot rollers and the whole nine, so getting her to try something new was indeed a bit of a challenge, but that was the toughest part of her soles&apos; rehab. Expect great results from this product. Since regaining her sense of mobility and balance mom has started leisure walking more, joined aquafit, and generally looks like a whole new (younger) person. Wish I&apos;d done this sooner. Live and learn...and share!